A Chinese Bookworm Raises Her Voice in Cyberspace. (Foreign Desk)(THE SATURDAY PROFILE) by Jim Yardley. The restaurant in the fashionable Qianhai district is almost empty, courtesy of the afternoon rains, though a small young woman is sitting on an upstairs sofa, slightly uncomfortable in her chic surroundings. With her oval glasses, shy demeanor and slightly hunched posture, the woman, Liu Di, looks like a bookworm. What she does not look like is a threat to anything, certainly not China's government. Yet the government has already imprisoned her for a year. In recent months, during significant dates on the political calendar, officials have posted security officers outside the Beijing apartment she shares with her grandmother. ''They think I'm a dangerous figure,'' said Ms. Liu, 23, giggling slightly at the thought as she picked at a Thai rice dish. It is Ms. Liu's other identity that has made her a target of the Communist Party. 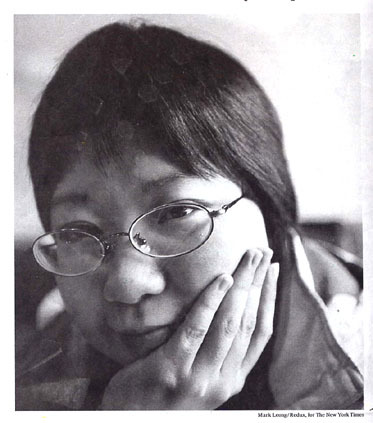 Known on the Internet as Stainless Steel Mouse, she is a dissident whose incarceration over her writings attracted international attention from human rights groups that demanded, and eventually helped win, her release. Even now, roughly eight months after she was freed, Ms. Liu must live a watchful life. Upon her release, she resumed her studies at Beijing Normal University, yet for months administrators left it unclear whether she would be allowed to graduate. She monitored courses until she was finally awarded her diploma in late June with a degree in psychology. She did not attend the ceremony. MS. LIU first logged onto that other world when she was in college. She had grown up in Beijing in a family that revered books. Her father worked in the library of the China Fine Arts Museum, while her mother was a factory worker who died when she was 15. Her grandmother was a reporter for the government's main newspaper, People's Daily. In cyberspace, Ms. Liu found her community. She plumbed literature for a nom de plume, trying Clockwork Orange and Banana Fish (a J.D. Salinger reference) before settling on Stainless Steel Mouse, from the science fiction of Harry Harrison. She began participating in discussions on a Web site called ''Democracy and Freedom,'' which is often at odds with the government. By 2001, she opened her own site, much of it dedicated to literature, but she also published some articles calling for more freedom. As cyberspace became her home, she began to defend what the Chinese call netcitizens. She wrote an essay defending a man jailed because of political postings on his Web site. She defended another intellectual singled out by the government for organizing a reading association and for posting political essays online. She wrote a critical attack on an advocate of nationalism and began dabbling in satire and parody at the government's expense. Terrified, she said, she scaled back on her online writing. But two months later, administrators ordered her to the campus police station, where officers took her to a Beijing prison. She was put in a cell with three other women, including a convicted murderer. Even today, she says she does not know which of her essays led to her arrest. In prison, she underwent some interrogation sessions. She said that she was frightened initially but that she was treated fairly well. She said that she had two meetings with a lawyer, and that her family was allowed to bring her books, magazines and university textbooks. She also learned from a guard that she was becoming famous in the outside world. Human rights groups were holding up her case to protest the government's treatment of Internet dissidents. Shortly before Prime Minister Wen Jiabao was scheduled to visit the United States last November, the government suddenly released Ms. Liu and two other Internet dissidents. Her father escorted her from the prison, and she cried when she got home. Of the international outcry over her arrest, Ms. Liu said she was stunned. ''I'm delighted that people care about me,'' she said. SHE spent her first month out of prison under house arrest at her father's apartment. Then, on Christmas Day, she was told house arrest had ended. In the end, she said she was never formally charged with a crime. But since her release, security officers have twice been posted outside her apartment -- in March, during the annual meeting of the National People's Congress, China's legislature and on June 4, the 15th anniversary of the government crackdown against pro-democracy protesters at Tiananmen Square. Even so, Ms. Liu has resumed writing. Several months ago, she signed an online petition calling for the release of Du Daobin, another online Internet essayist. (Mr. Du had been jailed after calling for her release from prison. He was recently convicted of subversion but was given a suspended sentence.) She recently wrote an article in a Hong Kong magazine criticizing the arrest of two crusading newspaper editors in southern China. She still surfs the Internet late into the night. Government monitors have managed to block her name Stainless Steel Mouse from some Web sites. But she said she sometimes uses another moniker: Titanium Alloy Mouse.